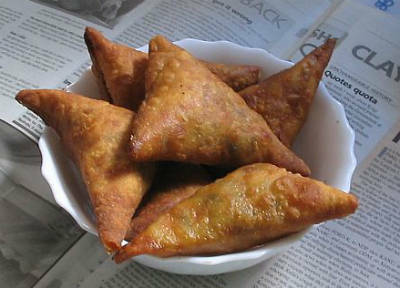 Samosas with a twist… With a mixed fruit filling, this samosa is sure to be a hit with guests. 1. Combine the fruits, mace powder and orange juice in a bowl. 2. Mix ghee, maida and enough water in another bowl and knead well to a pliable dough. 3. Make small puris and add 2 tblsp of the fruit mixture. 4. Fold into a triangle and seal the edges with little water. 5. Heat a flat tawa over medium flame. 6. Place the prepared samosas and apply ghee around the edges. 7. Cook on both sides until golden. Feel free to comment or share your thoughts on this Fruit Samosa Recipe from Awesome Cuisine.